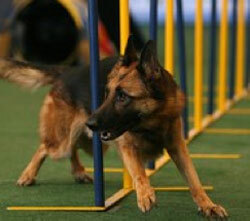 Read some of our fantastic articles relating to German Shepherds relating to GSDS. Spare a thought for the many dogs who have no homes yet and will be spending Christmas in kennels. For many of these dogs, sadly it will be their second Christmas in kennels which are not good for any dog, especially for a large breed like a GSD. Most of these dogs in kennels will have little chance of being rehomed until well into the new year, so we will have some pretty hefty kennel bills, keeping them safe and warm until they find new homes next year. As an organisation that relies totally on donations to fund the work we do, we are very grateful to everyone that has made a contribution towards our rescue and I am especially grateful to all our wonderful volunteers who work so hard fundraising for the dogs. Even you online shoppers have contributed by shopping through Easyfundraising. Indeed last week we received a cheque for £721.51 bringing the total amount raised since we joined, to a whopping £11,478.75. So when the new year sales start or if you are booking a holiday, please don't forget to go shopping through Easyfundraising. We are also absolutely delighted to announce that Support Adoption For Pets have informed us that they are awarding us a grant of £10,000 which is specifically to help towards the cost of our kennel bills. Whoop whoop. Read more. The Southeast region is celebrating; they have a supermodel in the region! 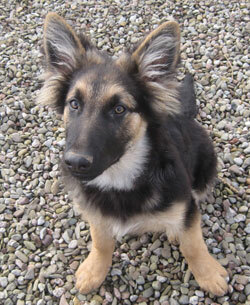 Some months ago they entered one of our dogs Lana into the Kennel Club Calendar competition. 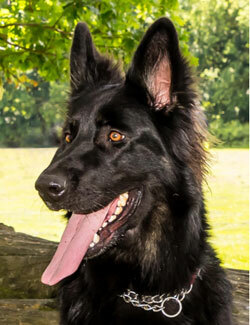 The wonderful Dave (who also beautifully captured our kennels dogs to relaunch them on the website) did us the great honour of taking lots of pictures of Lana, who at the time was in kennels and needing a home. They didn’t think they stood a chance, but low and behold an email arrived to say that Lana has been chosen as a winner and her picture would appear as March in the Kennel Club 2017 calendar! On October 22nd they went off to Excel London to Discover Dogs with Lana and her new owner (yes she got adopted too – double reason to celebrate!) 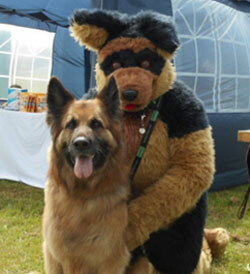 as representatives of German Shepherd Dog Rescue. A fabulous day was had by all, and our very own supermodel lapped up the limelight like a true professional. Wellanytimeit has indeed been a very strange year, not only for our weather but on the rescue front too. It's certainly been a bit of a roller coaster ride and it has been difficult to predict how things would go, given that they haven't followed the usual patterns. What we expect to be quiet months have turned out to be our busiest and vice versa. I had expected July and August to be quieter for adoptions because of the holidays, but that has not turned out to be the case. This, of course, is very good news for all those lovely dogs waiting for new homes, especially all those that have spent so long in kennels. We do still have a number of older dogs who have been in kennels far too long because adopters want young dogs. One poor dog has been in kennels 4 years which is no life for him. Please spare a thought for our oldies and maybe consider adopting one, you will not regret it. It's not their fault they were discarded and they should not have to spend the rest of their lives in kennels because they are deemed too old. Many of these dogs have never had homes at all and anytime they could spend in a home would be the best time of their lives. Read our latest newsletter. Well, it has indeed been a very strange year, not only for our weather but on the rescue front too. It's certainly been a bit of a roller coaster ride and it has been difficult to predict how things would go, given that they haven't followed the usual patterns. What we expect to be quiet months have turned out to be our busiest and vice versa. I had expected July and August to be quieter for adoptions because of the holidays, but that has not turned out to be the case. This, of course, is very good news for all those lovely dogs waiting for new homes, especially all those that have spent so long in kennels. 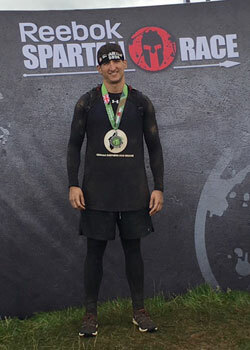 Lots more in our newsletter including how Joe Johnson competed in the gruelling Spartan Race in Edinburgh to raise money for GSDR. This event is a 22 kilometres mountain run through Penicuik in Edinburgh containing 25 obstacles ranging from 9-foot wall climbs to crawling under barbed wire, swimming across lakes and monkey bars etc. In May and June, we received a total of 112 dog rehoming forms, lower than previous years which is good. We also received over 400 adoption form applications during that period which sounds high, but I have to say that the quality of many of these potential homes is not of the standard we would like. It doesn't help that potential adopters put in multiple applications to many rescues and often our volunteers have their precious time wasted chasing homes that aren't prepared to wait. 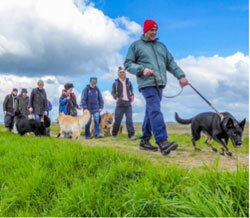 The summer months will be busy on the fundraising front with many events organised and we hope that these will be well supported to help raise much-needed funds to cover our vet and kennel bills, which this year have reached an all-time high. After a very busy start to the year with January being a cracking month for rehoming, it has now gone strangely quiet which is not good given the number of dogs that we have needing homes. It's as if everyone is in hibernation so I'm guessing the late spring and the bank holidays have had a major impact and that hopefully, things will start to pick up again now that the weather has turned slightly warmer. We have now reached an all-time high with numbers of dogs in commercial kennels and we cannot sustain this in the long term. 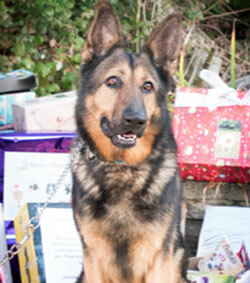 Also, it is not good for German Shepherds to be in kennels for long periods, they need to be in homes. Well after a cracking start to the year for adoptions, things slowed down a little in February, although there was no let up in the number of rehoming forms coming through. Traditionally these first few months of the year are quieter and the cold, wet, windy weather hasn't helped much. March is usually the month when things start to perk up as the nights get lighter and the clocks go forward. 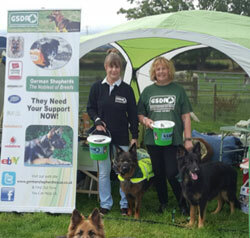 2015 was a good year for GSDR, we have grown and become even bigger and better which is all thanks to the hard work and dedication of volunteers. The signs are that 2016 is also going to be a very successful and busy year all round for GSDR, not only in terms of the number of dogs that will need our help, but I know that the regions have much planned to raise funds and create further awareness for the rescue. We took in a very cute puppy called Eddison on the 30th December who has epilepsy and was taken to a vet in Colchester by his owner to be PTS. He’d started to fit after his first vaccination but fortunately, the vets rang our SE Coordinator to see if GSDR could help and of course, we did. 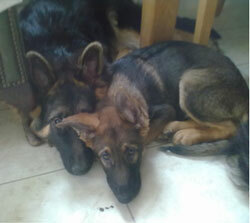 Here is Eddison our epileptic puppy, pictured with Stevie Wonder our blind puppy. Little Ed had a very rough time and we thought we might lose him, our biggest fear was brain damage. But with the wonderful help of Your Vets and following a short stay in the hospital, he has started to be a proper puppy again. He has been clear of fits for three weeks now and although he has what can be called "odd moments" he is doing well.